I decided to track it month by month for my gardener friends. I like to see how the exact same garden just changes in 4 weeks.... Incredible! When you walk up the driveway from the street you get this delicate smell of lilac... Definitely a show stopper as I notice people out for a walk stopping in front for a look and a sniff. I split that grass (in the back) in 4 pieces! It's always a work in progress. 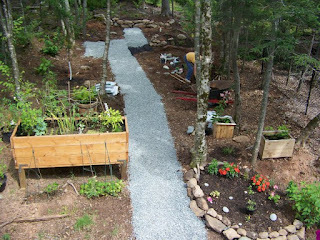 I have lost trees, growth which is natural for a treed area has sprouted and I need to add more crushed stone. The raised box in the back is what my husband built 2 summers ago. Directly in front are some peas and beans I have started (behind the rock garden). I am growing a tomato, onion and a pepper in a bag on top of my start of the lasagne garden. You can see a haskap bush to the very right.